Habitat modification (i.e., disturbance) and resource availability have been identified as possible mechanisms that may influence the invasibility of plant communities. In the Mojave Desert, habitat disturbance has increased dramatically over the last 50 years due to increased human activities. Additionally, water availability is considered to be a main limiting resource for plant production. To elucidate the effects of soil disturbance and water availability on plant invasions, we created experimental patches where we varied the levels of soil disturbance and water availability in a fully crossed factorial experiment at five replicated field sites, and documented responses of native and non-native winter annuals. The treatments did not significantly affect the density (seedlings m−2) of the non-native forb, Brassica tournefortii. However, the relationship between silique production and plant height differed among treatments, with greater silique production in disturbed plots. In contrast to Brassica, density of the non-native Schismus spp. increased in soil disturbed and watered plots, and was greatest in disturbed plots during 2009 (the second year of the study). Species composition of the native annual community was not affected by treatments in 2008 but was influenced by treatments in 2009. The native forb Eriophyllum sp. was most dense on water-addition plots, while density of Chaenactis freemontii was highest in disturbed plots. 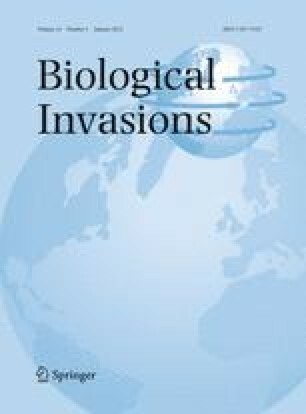 Results illustrate that habitat invasibility in arid systems can be influenced by dynamics in disturbance regimes and water availability, and suggest that invasiveness can differ between non-native annual species and among native annuals in habitats undergoing changing disturbance and precipitation regimes. Understanding the mechanistic relationships between water availability and non-native plant responses will be important for understanding the effects of shifting precipitation and vegetation patterns under predicted climate change in arid ecosystems. The 2007 Nevada Conservation Corps group helped with plot set up, and University of Nevada Las Vegas undergraduate students with the Department of Environmental Studies and School of Life Sciences assisted with water applications. Toshi Yoshida reviewed early versions of the manuscript. We thank Alice Newton, Kent Turner, and Carrie Norman for logistical support and Cheryl Vanier for statistical advice. The comments of two anonymous referees significantly improved the manuscript. This study was supported by a cooperative agreement between the National Park Service (Lake Mead National Recreation Area) and the University of Nevada Las Vegas, partially funded by the Clark County Multiple Species Habitat Conservation Plan.